What is a solenoid water control valve? A solenoid water control valve is an electromagnetic device. It function to open or close access to water flow. We can use to open or close access to any fluid such as a gas or oil etc. The video below demonstrates different component within a typical solenoid valve. Any current carrying coil will produce a magnetic field. This exert a mechanical force of attraction or repulsion on any magnetic object. It produce the same effect like a permanent magnet. However, in this case it is an electromagnet because it become a magnet through a current carrying coil. That is, the field could be made to turn ON or OFF as desired by switching the current through the coil ON or OFF signal. This magnetic effect find applications in magnetic relay, solenoid and some other types of transducers. A solenoid is a device that produces mechanical motion when a current carrying conductor coil receives electric current. The movable portion of a solenoid is the armature. A relay is a solenoid set up to activate switch contacts. This occur when its coil receives electric current. The minimum amount of coil current to actuate a solenoid or or relay from its “normal” (de-energized) position is Pull-In current. Drop-out current is the maximum coil current below which an energized relay will return to its “normal” state. Armature is the movable magnetic object, and you can move most armatures with either direct current (DC) or alternating current (AC) energizing the coil. The polarity of the magnetic field is not important for the purpose of attracting an armature. Therefore. you can use solenoids to open door latches by electrical means, open or shut valves, move robotic limbs, and even actuate electric switch mechanisms. 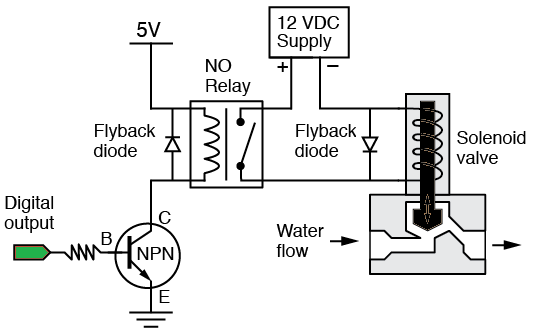 Like a relay, a solenoid valve may be normally open or normally closed. However, signal to energize the solenoid valve could come from a remote switch or another transducer. This may be light sensing, heat sensing or pressure. Others are magnetic sensing, or whatever we desire as our signal source.